You are searching for more on mold inspection, testing for mold, mold detection, the mold test, or even smartly narrowed it to Chicago mold inspection, Chicago mold testing service, or mold expert in Chicago (or the equivalents). This page has all you need to know about Chicago Inspection Agency’s certified mold inspection process and the mold tests that follow it. (For the dangers of mold, go to our Symptoms of Mold; Dangers of Mold in House health issues page. For our mold testing qualifications, go to the Chicago Mold Inspector page. So, you have mold, and need to find out more. Do you search for a do-it-yourself mold test? A certified mold inspection company? Or go right to mold remediation company? Ok, then why not search for a Mold Remediation Company and let them do the mold inspection? Some even advertise free or cheap mold testing. Mold remediation companies make their money from the much costlier job of mold cleanup. This inherent conflict of interest opens the possibility of costly up selling based on interpreting or slanting the mold test itself. 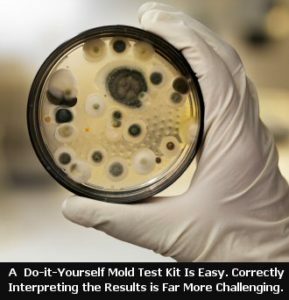 You can never really be sure the mold testing itself is completely unbiased unless you use an independent mold testing agency. A quality, professional mold inspection will always have a cost. Why not be certain it’s independent and unbiased? So, a certified mold test from an independent mold inspection company is what to look for? Considering the benefits, most people would say yes. Chicago Inspection Agency will not only generate an unbiased mold test report, based on a certified mold inspection, but will also and provide you and your family a personalized mold health advisory and direction for your next course of action. No difficult instructions to follow. No incomprehensible terminology. No doubt from anyone about accuracy. Above all, no conflicts of interest. We are your advocate. We dedicate our knowledge gained from thousands of Chicago mold Inspections in over a decade of Chicago mold testing solely to you. Personalized Q&A about your family’s health conditions, addressing mold health concerns specific to the test. Exacting mold inspection with a detailed certified mold test report of the entire area contracted for all mold types, locations and concentrations. One-on-one interpretation of the mold test report, explaining the concentrations and types of mold reported and associated specific mold health risks it poses to your family. Seasoned, independent advisory on what options are available to take next. A certified mold inspection from a professional mold expert with associated mold test report honored by insurance carriers, and admissible in court. the certified mold test report assures independent verification of the presence or absence of mold when buying or selling a home. This both protects the buyer and adds value for the seller. With the initial independent baseline, CIA can schedule a certification of remediation mold test after your mediator work is done to assure any no-mold guarantee has been properly met. One call, single source for additional indoor hazard testing such as Radon, and Volatile Organic Compounds (such as formaldehyde). 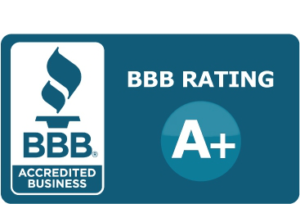 Fully licensed, BBB A+ rated home inspection services – a convenient, one stop for for homeowners, whether buying or selling. 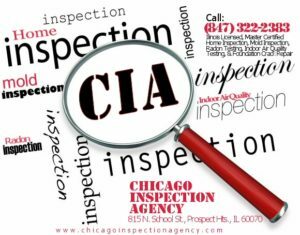 What exactly is involved with a mold inspection from Chicago Inspection Agency? First and foremost we listen to your concerns. We ask about health of your family, other occupants, why you think mold is in the home. We also address you budget concerns. After the initial interview, we’ll propose your options and generate a mold inspection quote. Considering our quality and commitment, you’ll be surprised how reasonable our prices are! What mold detection do you use? Click here to view the initial Chicago mold test. Click here to view follow-up mold test (after remediation) at the same property. Notice the chain of custody, canister serial number tracking, and exacting airflow and test type tracking. This professionalism is just one of the reasons why can trust CIA for your mold inspection. What else in involved in a mold inspection? Very often the source of the mold isn’t readily evident. Mold in homes can hide behind walls, in flooring, ceilings, carpeting – virtually anywhere there is moisture and a food source to grow (mold doesn’t need steak to thrive – wet drywall is just fine, thank you!). 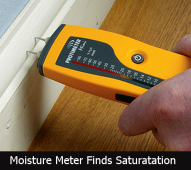 To find hidden mold, CIA will use a moisture meter. Our highly sensitive moisture meters detect both the presence and levels of saturation and in virtually any material – drywall, stone, concrete, wood, vinyl and many more. When touching the surface to be tested, it sends a non-invasive electrical signal into the material (up to approx. 1″ thick). The meter then assesses in relative terms whether it’s dry, borderline, or saturated, and returns exact levels numerically. It’s not affected by surface moisture, so it can test below the surface even if it’s wet on the outside. How important is the mold testing issue in selling my home, and buying a new one. I Googled “black mold and home selling” and got some disturbing results. Surely, mold in your home is a problem for your family’s health, but when buying and selling, it’s becomes financially crucial. Selling a home with mold, or buying one without disclosure often winds up in court. According to the Insurance Information Institute, homeowners’ toxic mold claims can reach $100,000 or more and commercial claims can run into the millions. The typical buyer or seller property dispute involving toxic mold now average $15,000 to $30,000 to handle, compared with $3,000 to $4,000 for claims not involving mold. Back In 2003, The Insurance Institute recorded over 10,000 ongoing lawsuits across the country. The number today is likely an order of magnitude higher, and since as the science has evolved, judges at every level have upheld that toxic mold exposure is “indicative of a causal relationship.” in many severe illnesses. The economics of mold translates into real dollars in value for homes with mold issues versus homes certified mold free. You can’t avoid it – whether buying or selling, the question of mold in the home will come up. Having a professional, certified mold inspection from CIA done is the best way to start. And don’t forget, Chicago Inspection Agency can do your radon, VOC, and home inspection, too! Whether you are staying where you are, or buying or selling your property, don’t find out too late how critical mold testing can be to the health of your family or successful transaction of your property. Call us today to schedule a mold inspection. Thank you for searching. We’re glad you found us, and look forward to your call! Chicago Inspection Agency Thanks You!